The Terracotta Wall Clock measuring 19X11.5 cm. They are made out of baked earth & acrylic colors have been used. These are made with the with the help of optimum quality of raw materials that are procured from certified vendors of the market and can be availed from us at market leading prices. Keeping in mind the diverse necessities of our patrons, we are involved in providing an extensive series of Round Terracotta Clock. 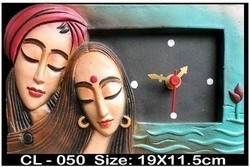 A sensational Terracotta wall clock. Delicate hand crafts from the tribal areas of Birbhum, Wet Bengal. 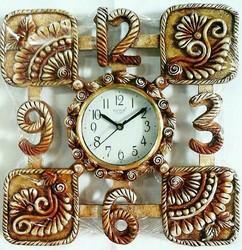 The sensational handcrafted work on the wall clock with rustic style gives an exotic look of the wall. Made in Terracotta & wood and fine finishing of handcarving around the numbers of the clock and the corners of the clock will surely make the wall look bright and rustic.